Spanish bomba rice absorbs more liquid than other rice varieties. If you can’t get bomba, use another medium-grain rice, such as Goya brand, but add only 3-1/2 cups of broth to the rice instead of 4-3/4 cups. Put the saffron in a large mortar and grind to a powder with a pestle (or crumble the saffron into a 1-cup liquid measuring cup and grind it with the back of a spoon). Heat the clam juice to simmering in a saucepan or in a microwave. Pour it into the mortar (or cup) with the saffron and set aside to infuse. Grate the onion half on the largest holes of a box grater to get about 1/4 cup grated onion; set aside. Grate both tomato halves on the box grater all the way down to the skin. Discard the skin. Put the oil in a 14-inch paella pan. Set over medium heat, add the grated onion, and cook until it softens and darkens slightly, 2 to 3 minutes. Add the grated tomato, chopped garlic, pimentón, and 1/4 teaspoon of the salt; cook gently in the center of the pan, stirring frequently, until the mixture, called a sofrito, becomes dark red and is a very thick purée, 20 to 30 minutes. Cook it as long as you can, being careful not to let it burn. As it thickens, lower the heat, and if it starts sticking to the pan, stir in a little water. While the sofrito cooks, pick through the mussels to find the prettiest eight; reserve these in the refrigerator. Put the shrimp shells in a large saucepan set over medium-high heat and cook, stirring, until they’re dry and pink, 2 to 3 minutes. Add the water or fish stock and all the remaining mussels, and bring to a boil over high heat. Reduce the heat and simmer for 10 minutes. Strain the broth, discarding the shrimp shells and the mussels. Wipe out the saucepan and pour the broth back into it. Add the saffron-infused clam juice to the broth and bring to a gentle simmer. Add the remaining 1/2 teaspoon salt, taste, and add more if necessary; it should be quite well salted, but not salty. Cover and reduce the heat to very low. When the sofrito is done, add the rice and cook over medium heat, stirring constantly to combine it with the sofrito, for 2 minutes. Increase the heat to high and pour 4-3/4 cups of the hot broth (if you don’t have enough, supplement with water) into the paella pan. Use a spoon to spread the rice evenly, but don’t stir for the remainder of the cooking. Adjust the heat to get a vigorous simmer, repositioning the pan to get bubbles all the way to the perimeter. Check for socarrat (the delicious browned rice that has stuck to the bottom of the pan) by using a spoon to feel for resistance on the bottom of the pan. Check in various spots. If there is none, increase the heat to medium high and carefully cook, moving the pan around, until you hear crackling and feel resistance, 1 to 2 minutes; if you smell any burning, remove the pan from the heat. Remove the pan from the heat and cover tightly with foil. Let the paella rest for 5 to 10 minutes. Put the pan on the table, remove the foil, and invite everyone to squeeze lemon over the section in front of them. 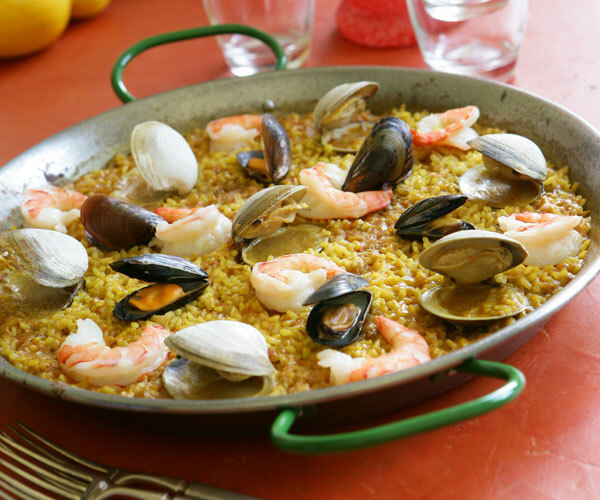 Traditionally, paella is eaten directly from the pan, starting at the perimeter and working toward the center; boundaries become clear as you go. Totally awesome recipe. Make it often for my family. I didn't have a paella pan at first so I just used the bottom half of a boiler pan and moved it around the element as it cooked at it worked just fine.